Talmudist, physician, author, and expurgator of Hebrew books; born in Safed, Palestine, about 1550; died in Italy about 1620. He was educated at the rabbinical college in his native city, studying not only Talmud, but also medicine. After having been granted the degree of doctor and the title of "Rab," he lectured on Talmudic law in Safed. His fame as a physician spread far and wide, and finally reached the ears of the Sultan of Turkey, who summoned him to Constantinople as court physician. Yerushalmi subsequently became a convert to Christianity; he went to Rome, and was received at the College of the Neophytes, where he taught Hebrew. During the most active period of the expurgation of Hebrew books under the Inquisition in Italy Dominico's services were in great demand; and first in Venice (1578-92? ), later as chief reviser of the censorship commission in Mantua (1595-97), he had opportunity for placing his signature in more books and manuscripts than any other of the Italian expurgators. His activity in this direction continued at intervals—in places, however, not yet identified—almost until his death. Dominico's works included, according to his own statement, "Ma'ayan Gannim" (Fountain of the Gardens), on the fundamental principles of the Christian faith. He also translated into Hebrew the whole of the New Testament, and most of the Apocryphal books (1615-17). He was the compiler of the "Sefer ha-Ziḳḳuḳ" (Book of Expurgation), still in manuscript, one copy of which (in the library of Cardinal Berberini, Rome) shows revision by him as late as 1619. Bartolocci dates Dominico's conversion at the beginning of the seventeenth century, at about his fiftieth year. But even if it be assumed that the dates of his earliest censorship have been misread, it is certain that he acted as censor before 1595. Furthermore, Bartolocci and Wolf state that Nicolaus Mursius in his "Relatione della Città di Constantinopoli" (Bologna, 1671) mentions as court physician of the Turkish sultan a Jew who later became converted under the name of "Dominico Ierosolymitano." 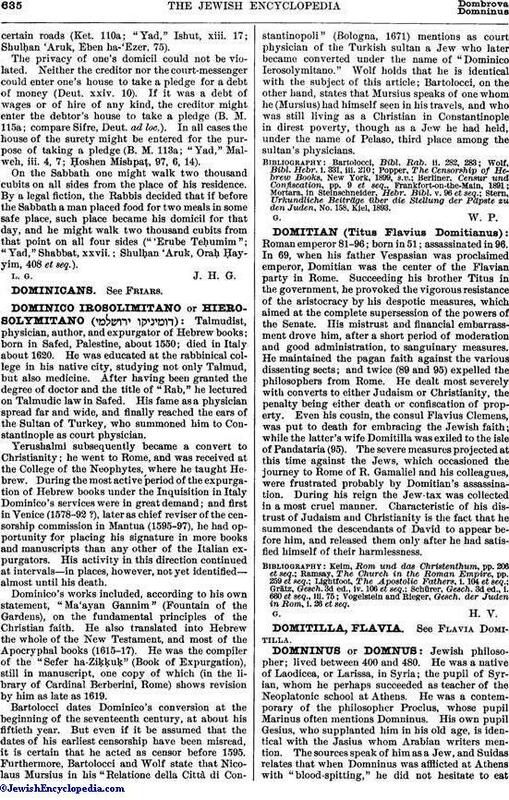 Wolf holds that he is identical with the subject of this article; Bartolocci, on the other hand, states that Mursius speaks of one whom he (Mursius) had himself seen in his travels, and who was still living as a Christian in Constantinople in direst poverty, though as a Jew he had held, under the name of Pelaso, third place among the sultan's physicians. Stern, Urkundliche Beiträye über die Stellung der Päpste zu den Juden, No. 158, Kiel, 1893.